Pop has long been history. And for some years Düsseldorf was a central meeting place for labourers in the electronic lab. In Electri_City, the musician and scene connoisseur Rüdiger Esch has gathered together voices from past and present and combined them in a panopticum of the pioneer years. It is a late, almost sublime triumph. At the start of 2015, before the general refurbishment of the New National Gallery in Berlin, Kraftwerk performed a concert cycle that, on each of eight sold-out evenings, placed one of their albums from Autobahn to Tour De France centre stage in an elaborate 3-D installation. The forefathers of German electronic music in the incunabulum of modernist architecture by Mies van der Rohe. “If this is a visionary, utopian idea of a building, Kraftwerk stands for a visionary, utopian idea of music”, says the Director of the New National Gallery Udo Kittelmann, describing this close dance of cultures. Robots in the transparent palace of glass. Computerliebe under the girded steel roof. Rarely has Pop seemed so sublime as here. Kraftwerk thus returned to its origins. Even before its official founding, the group moved in the tension field of the Düsseldorf Art Academy, which back then overlapped with glam rockers and fashion designers in the avant-garde club “Creamcheese”. It was here that, in December 1968, Joseph Beuys and his assistants chained themselves for hours to a beer table, surrounded by psychedelic noise and experimental films. There was hardly an evening without a performance. A primordial soup compounded of the vapours of dark beer and concepts, which after 1970 also produced a singular school of sound. Bands such as Kluster (later Cluster) and Neu! sought their own musical paths and wanted to depart from that of the Anglo-American models. “These were the days of kraut rock, cosmic music, prog rock and the pioneers of electronic”, the introduction to the book Electri_City – Elektronische Musik aus Düsseldorf (i.e. Electri_City – Electronic Music from Düsseldorf) tells us. In writing it, its author, the musician Rüdiger Esch, conducted dozens of interviews with the leading figures of the scene and has assembled from these original soundtracks a polyphonic chronicle. The first generation wanted to be “progressive”. Free of ideology and thought control. It looked to advertising and industrial design, oriented itself to the newly emerging synthesizer technology. “This was a transitional period: the electronic alienation of acoustic instruments. It was then developed further so that at some point the instruments were omitted and there was pure electronic music”, says the bassist Eckhard Kranemann, recalling the beginnings of Kraftwerk. These sound experiments did not yet have a song structure and the major record companies responded to them with reserve. Thus many memories in Electri_City revolve round the producer Conny Plank, who sat behind the mixer console for the first records by Kraftwerk, Neu! and La Düsseldorf and who died in 1987. He gave Düsseldorf electronic music the necessary degree of timing and rhythm, and thanks to his contacts to the major labels was also an important catalyst. Even a decade later, the Düsseldorf electro-punks trusted in his “machine park sounds”. “We wanted to show that Germany too has stylistically distinct, modern popular music, which has its origin in our own culture”, says ex-Kraftwerk drummer Wolfgang Flür, also speaking on behalf of his bosses Ralf Hütter and Florian Schneider, who refused to grant interviews. When Autobahn gained first place in the American charts in 1974, and with the subsequent tour of 23 cities, Kraftwerk became the most influential band in Düsseldorf. They chalked up commercials successes, which many of their former colleagues felt obliged to renounce. Klaus Dinger, for example, the Kraftwerk drummer in its early days, would have no truck with the mechanisms of the pop industry both with his own band Neu! as later with La Düsseldorf. 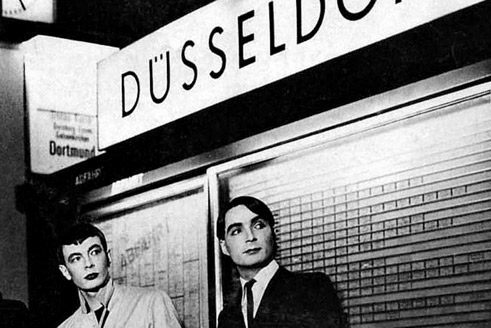 British colleagues like Martyn Ware of Heaven 17 and David Miller of Mute-Label (Depeche Mode) confirm the international recognition enjoyed by the aesthetics of Düsseldorf electronic music: “For me”, says Ware, “Kraftwerk’s visual presentation was as important as the music”. And Criss Cross of Ultravox! points out that even the exclamation mark behind the name of his London punk band was a direct allusion to Neu!. The break occurred at the end of the 1970s when young bands like DAF and the Krupps sought their own approach to electronic sound. Harder, radical, devoid of the stately synth pads of their predecessors. “Kraftwerk never interested me”, DAF singer Gabi Delgado Lopez has gone on record as saying, thus highlighting the prevailing anti-attitude towards the father figures. Yet DAF too, after its wild storm and stress phase in London exile, beat a path to the door of Conny Plank’s studio, where Plank instantly grasped the staccato beats of Kebapträume and Der Mussolini. Finally, instrument technology advanced with great rapidity. Analogue synthesizers like the Korg MS 20 or mini sequencer made possible the contemptuous attitude expressed by ex DAF man Chrislo Haas: “Just plug the thing into the amp and see what comes out”. Machine music generated hard power surges. By 1986, when the Düsseldorf Pop project Propaganda released their dark anthem Dr Mabuse with the British label ZTT, melodies were back again. And it is not an accident that Rüdiger Esch ends his book in this year with Kraftwerk’s last proper album, Electric Cafe. Here the past masters of electronic music used digital recording technology for the first time. Soon the means of production were so inexpensive that the decentralized era of bedroom producers could be rung in. For Kraftwerk there remained only the entry into the halls of high art. Ralf Niemcyzk writes since the eighties about music, pop culture, sports and urban development. Since 2011, he works as an editor for “Rolling Stone” Magazine.